The Kite may not be the coolest looking paper airplane on the block, but those big ugly wings sure do the trick. 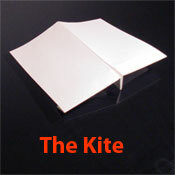 The kite is capable of great distance and accuracy, but is very sensitive to changes to it's wings. To make this great paper airplane you will need only a single sheet of paper. 1. Beginning on one end of the paper, fold it down evenly about 1 inch. Repeat this step for a total of 8 folds. Keep your folds as tight and even as possible. 2. 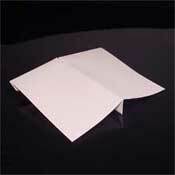 Flip the paper airplane over and fold it in half as shown. Good, tight folds on step 1 will make this easier, but a few crinkles won't hurt it. 3. Fold the first wing starting 1/2 to 1 inch from the center fold. 4. Fold the second wing exactly as you did the first. Your Kite may need some fine-tuning before it will fly perfectly straight.